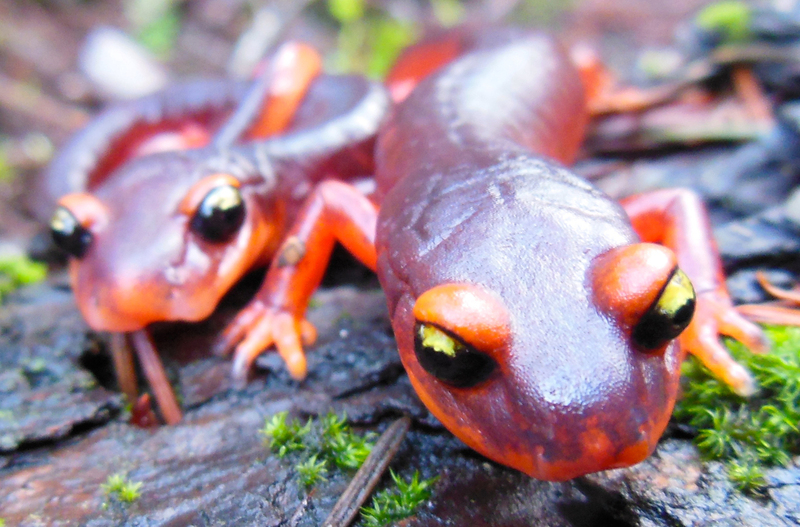 Scientists Urge Ban On Salamander Imports To U.S. To Keep Fungus At Bay : The Two-Way The chytrid fungus has wiped out populations of amphibians around the world. A type of the fungus infects only salamanders, and researchers have identified vulnerable areas in North America. The Ensatina salamander, a lungless species common along the U.S. West Coast, is one of hundreds of species of salamanders endemic to North America threatened by an emerging infectious pathogen. Scientists are calling for an immediate ban on live salamander imports in the U.S. to try to prevent the spread of a fungal disease that could potentially devastate wild North American salamanders. Almost half of the world's known salamander species live in North America, and many are already threatened or endangered. Salamanders may be inconspicuous, but they're important to the ecosystem — they eat disease-carrying insects, are a key link between the aquatic and terrestrial food webs, and may even aid the global carbon cycle. Some species produce antimicrobial compounds, and others are being studied to learn how humans might someday regrow limbs. They're also in danger from the chytrid fungus. When the Batrachochytrium dendrobatidis fungus, or Bd, was discovered in 1998 in parts of Australia and Central America, scientists could only watch as species after species of frogs and salamanders disappeared in what has become a worldwide die-off. Vance Vredenburg, a biologist at San Francisco State University, has seen firsthand what chytrid can do to amphibians. He calls it "absolute decimation." Two years ago, researchers identified a second type of chytrid fungus, Batrachochytrium salamandrivorans, or Bsal, that researchers think infects only salamanders. This new fungus was discovered in wild European salamanders. Scientists think it came from Asia and spread to wild salamanders through the international pet trade. So far, Bsal has not yet been found in the Americas. In a report published Thursday in the journal Science, Vredenburg and his colleagues identified areas in North America that they think are most vulnerable to the Bsal fungus. 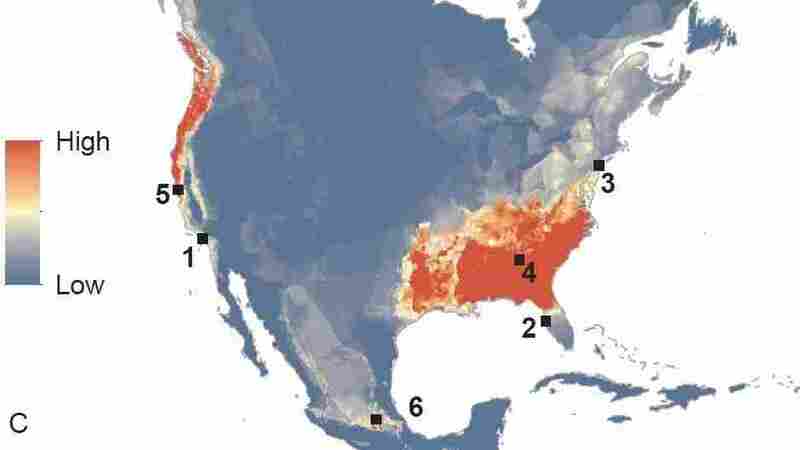 They did so by layering maps of the number of wild salamander species in North America on top of projected best habitat for the fungus. The group determined that salamanders in the southeastern U.S., the western U.S., and the highlands of central Mexico are most at risk. A model of the predicted vulnerabilities of wild North American salamanders to the chytrid fungus Batrachochytrium salamandrivorans, or Bsal. Then researchers identified the top five U.S. ports for salamander imports and calculated the number of salamanders brought in for the pet trade. In the past five years, nearly 800,000 salamanders entered the country through one of these ports — 91 percent were relatives of either fire-bellied newts or Vietnamese salamanders, thought to be the main carriers of Bsal. "What we found is the picture could be bad," Vredenburg says. "The areas that have some of the highest trade numbers in some cases overlapped with what our models predicted would have the most vulnerable species." Something has to happen, and fast, Vredenburg's group concluded. Their report urges the U.S. Fish and Wildlife Service to ban live salamander imports until scientists have a better understanding of the fungus and the danger it poses to native salamanders. Karen Lips, an amphibian biologist at the University of Maryland who has studied chytrid extensively, says that while there's a lot of uncertainty about the Bsal fungus and its carriers, the study is a step in the right direction. "It really shows the high risk to our native amphibians," she says. "Hopefully, this will help stimulate action." But when it comes to policy, Lips says, the Fish and Wildlife Service's choices are limited. The Lacey Act was established in 1900 and is now used to control the introduction of invasive species and prevent illegal trade in wildlife. However, there's no provision for wildlife diseases. "The Fish and Wildlife Service has been very interested in chytrid and amphibian diseases for many years," Lips says. "But there's a problem. Under the Lacey Act, they don't have the legal authority to do much." Scientists aren't the only ones pushing for action. Priya Nanjappa of the Association of Fish & Wildlife Agencies says that last year her group asked the Fish and Wildlife Service to create a temporary emergency rule that would place all salamanders — or at least those most at risk — under the protection of the Lacey Act. This spring, the Fish and Wildlife Service said it would consider that request. Meanwhile, Nanjappa, who is AFWA's amphibian, reptile and invasive species coordinator, is in charge of developing a nationwide response plan in case Bsal is found in the U.S. before imports are controlled. Unlike with the original chytrid fungus — which was widespread when it was discovered — scientists think they've identified Bsal in time to do something about it. "This time we got it right," Vredenburg says.